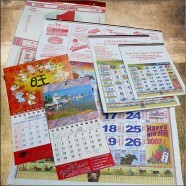 Promotional calendars offer a traditional way of promoting your business. We thus offer calendar printing services at reasonable rates for your marketing purposes. Our calendars come in various shapes, sizes and designs ranging from the budget friendly CD case calendar to the calendar pad or easel calendar. We also offer traditional mini, medium and big horse calendars, wall and desk calendars. You have to either choose from our wide range of design templates, or customize your calendar as per your own customized design. We offer calendars in various finishes to give it a unique look. Some of the popular finishes used here include matte, gloss, spot UV varnishes, die cutting, embossing and gold or silver foil hot stamping. With our calendar printing services, you can place your company name in front of your customer every day. We can print your calendar for you within 6 – 7 days upon confirmation of order, and have a minimum printing requirement of 50 calendars.